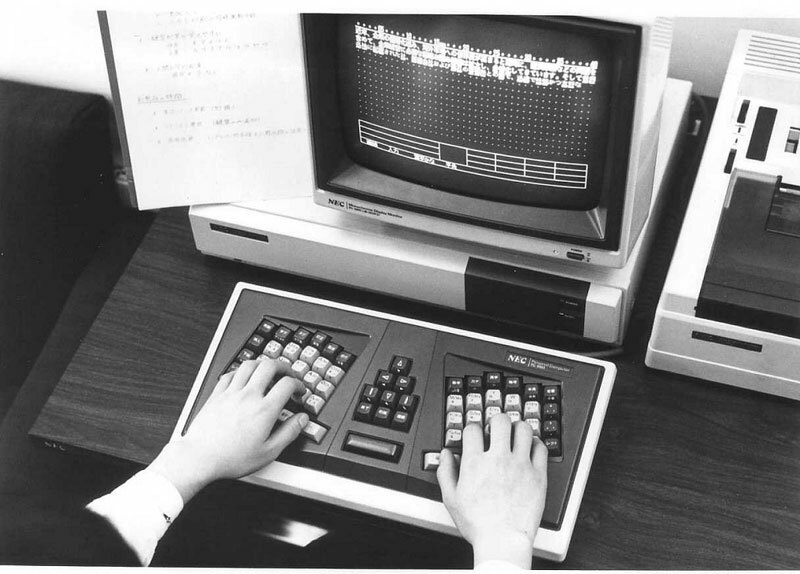 In March 1983, NEC announced a new input system for Japanese language word processors. This new input system was developed by Morita Masasuke, who was a special consultant to NEC at the time, and the "M" comes from his name. At the time, input speed was an issue for Japanese language word processors, due to the mixture of kanji (Chinese characters) and kana (phonetic letters) in sentences. Various methods were developed to improve input speed, including: the kana-kanji conversion system, the romaji (alphabetic letter) kanji conversion system, the pen-touch system, the so-called "kanji-teletype" system, and the association system where kanji were input with 2 kana characters. Each of these methods had advantages and disadvantages. In developing his new method, Morita noticed that the "on-yomi" pronunciations of kanji could be divided into 5 patterns. Input was done using 3-row, 5 column romaji keyboards placed at the positions of the left and right hand (see Note 1). With this system, one kanji could be easily input by combining a consonant (right hand) and vowel (left hand). 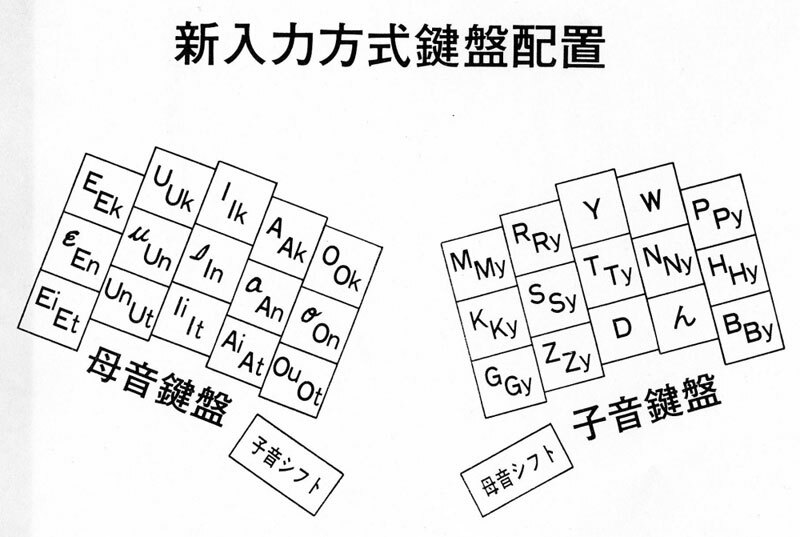 With only 30 keys, the M System keyboard had fewer keys than the JIS keyboard (which had 48) and there was no need to operate a key to designate kanji or kana (see Note 2). Furthermore, the keys were arranged in the order of the "50-character kana syllabary" sequence, so the layout was easy to remember, and data could be input quickly and smoothly with no extraneous burden in the operation. This made it possible to input at a speed more than two times faster than the kana-kanji conversion system. In August of 1983, this input system was commercialized for the PC-8800 Series, and marketed under the name PCWORD-M (comprised of 3 components: a keyboard exclusive to M system, expansion RAM board and software). Furthermore, in March 1984 NEC entered the personal word processor market with the PWP-100 personal Japanese language word processor which used this M system, and a number of M System word processors were subsequently commercialized. Exploiting the above characteristics, the keyboard is provided with vowel keys: A, I, U, E, O for the single vowel type in 1), Ai, Ii, Uu, Ei, Ou for the type in 2), An, In, Un, En, On for the type in 3), Ak, Ik, Uk, Ek, Ok for the type in 4), and At, It, Ut, Et, Ot for the type in 5). The single vowel keys a, i, u, e, o were also added exclusively for hiragana input. On the actual keyboard, there were 3 rows (top, middle, bottom) operated with the left hand, and in combination with the vowel shift (operated with the thumb of the right hand), this provided 6 different functions. The system had 15 consonant keys for the right hand: K, S, T, N, H, M, R, G, Z, D, ん, B and P. Using the consonant shift key operated with the left thumb, these could be shifted to K-Ky, S-Sy, T-Ty, N-Ny, H-Hy, M-My, R-Ry, G-Gy, Z-Zy, D-Dy, B-By and P-Py. (T, Ok) (Ky, O) (Ty, Ou) (Ty, Ou) (K, An).